Where an eligible company is controlled by a person in a capacity as trustee, is the ‘value of supplies’ made by this person, as defined by subsection 73H(2) of the Income Tax Assessment Act 1936 (ITAA 1936), based only on those supplies made by it as trustee? Yes. The ‘value of supplies’ made by the person in its capacity as trustee, to be included in the ‘R&D group turnover’ of the eligible company under section 73K of the ITAA 1936, is based only on those supplies made by this person as trustee of the relevant trust estate. The taxpayer is an ‘eligible company’ as defined in subsection 73B(1) of the ITAA 1936, and is an Australian company limited by shares. Trustee Company owns interests in the eligible company which carry the right to receive more than 50% of distributions of income or capital by the eligible company. Trustee Company is a wholly owned subsidiary of Parent, and also a trustee of a unit trust. Under the terms of the trust deed, no unit holder has any rights in relation to the voting power of the eligible company, nor does any unit holder have any right with regard to distributions of income or capital by the eligible company. The unit trust has not made any distributions in the last four years of income and no person(s) otherwise control the trust estate within the meaning of subsection 73L(4) of the ITAA 1936. The eligible company does not own interests in any company under subsection 73L(3) of the ITAA 1936 and does not control any trust estate or partnership under subsections 73L(3), 73L(4) or 73L(5) of the ITAA 1936. Nor is the eligible company affiliated with any person(s) under section 73M of the ITAA 1936. 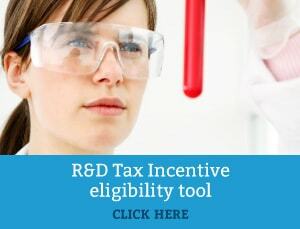 In addition to the other eligibility criteria set out in section 73J of the ITAA 1936, paragraph 73J(1)(d) of the ITAA 1936 states that an eligible company is eligible to choose the tax offset for the tax offset year, being the 2003-04 income year, if the R&D group turnover of the company for that year is less than $5,000,000.